For my kids, Internet access is a basic utility like electricity or water. They expect their tablets, laptops and smartphones to always be connected. And why shouldn't they? More and more of the apps they use require Internet access to work—even those that don't really need it for gameplay. And many of us are buying low-cost Chromebooks, and now HP's new line of Stream Windows laptops, that are designed to primarily run online apps. Internet access isn't a problem at home, but we don't have Wi-Fi in our home away from home, our car. For now, I commandeer one of our three car chargers and use my smartphone to put up a Wi-Fi hotspot. But there's a better way to get Internet access in your car—have it built in. You get better reception when you have 4G LTE Wi-Fi built into your car than you do on your smartphone. That's because car makers are able to use a bigger and better antenna than smartphone makers can cram inside your phone. And, you never have to worry about your phone running out of battery or experience the aggravation of having the person with the hotspot phone leave the car, cutting off Internet access and the kids' movie streaming off of Netflix. You can get 4G LTE Wi-Fi in cars, trucks and crossover vehicles built by Chevrolet, the first and only car company to make the option available on such a wide range of vehicles. Chevrolet's OnStar 4G LTE Wi-Fi can connect up to seven devices, which should accommodate even the most data hungry family. Using OnStar 4G LTE Wi-Fi is easy. After the initial setup, the in-car hotspot is ready for all of your mobile devices. And once you've paired a device, you can choose to have it connect automatically to the vehicle whenever you have Wi-Fi turned on. 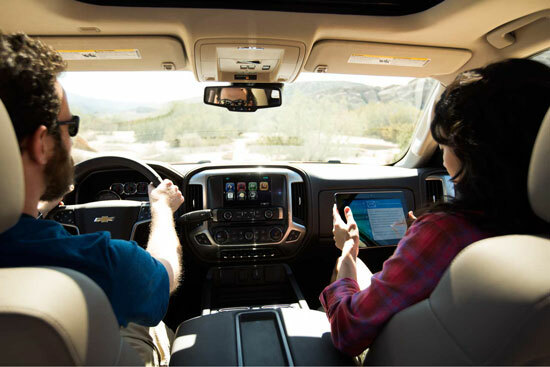 With a Chevrolet vehicle with OnStar 4G LTE Wi-Fi, you'll get always-on Internet access at broadband speeds. Now you can leave the scratched DVDs at home because you'll be able to watch Netflix, Amazon Instant Video and all of your other streaming sources in your car. The kids won't complain because their games will work on the road. And, you'll be able to get work done while you're waiting for soccer practice to end. So if you're in the market for a new car, built-in Wi-Fi is an option worth considering. Learn more about 4G LTE Wi-Fi on Chevrolet.com. Do you want built-in Wi-Fi in your next car? Join the discussion below! This is a sponsored conversation written by Techlicious on behalf of Chevrolet.